AppsFlyer's SDK provides app installation and event tracking functionality. We have developed an SDK that is highly robust (7+ billion SDK installations to date), secure, lightweight and very simple to embed. You can track installs, updates and sessions and also track additional in-app events beyond app installs (including in-app purchases, game levels, etc.) to evaluate ROI and user engagement levels. 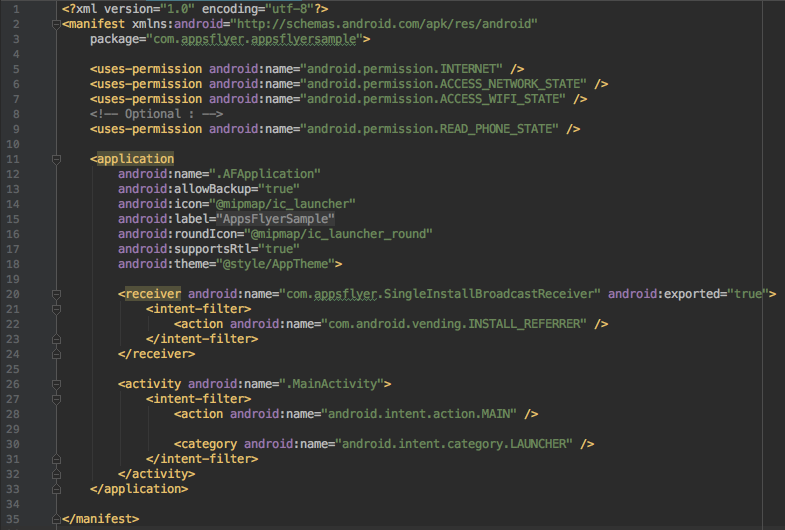 The AppsFlyer Android SDK is compatible with Android OS version 2.3 and above. The SDK is also compatible with non-mobile Android based platforms such as Smart TVs, including Amazon's Fire TV. For apps developed for Amazon's Fire TV, use AppsFlyer's Tracking Out of Store Solution. 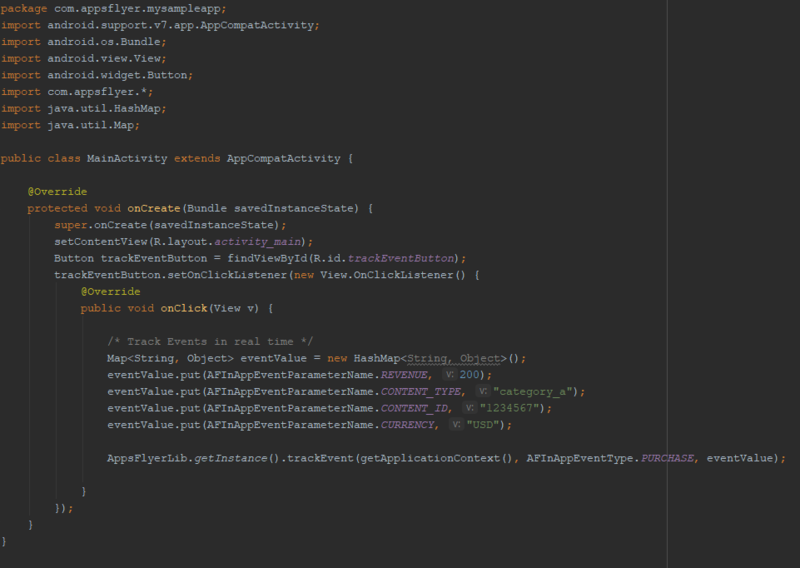 If you're migrating from AppsFlyer's Android SDK V.3.3.x click here. Before you begin integrating the SDK, add the app to your AppsFlyer account. To download the latest AppsFlyer Android SDK jar, click here. To verify the integrity of the SDK download, click here. For details of AppsFlyer's Sample App, click here. You can integrate the AppsFlyer's SDK either automatically using Gradle's Dependency Management or manually as an SDK.jar. The simplest way to integrate the SDK into your project is by using Gradle's Dependency Management. Version info can be found here. 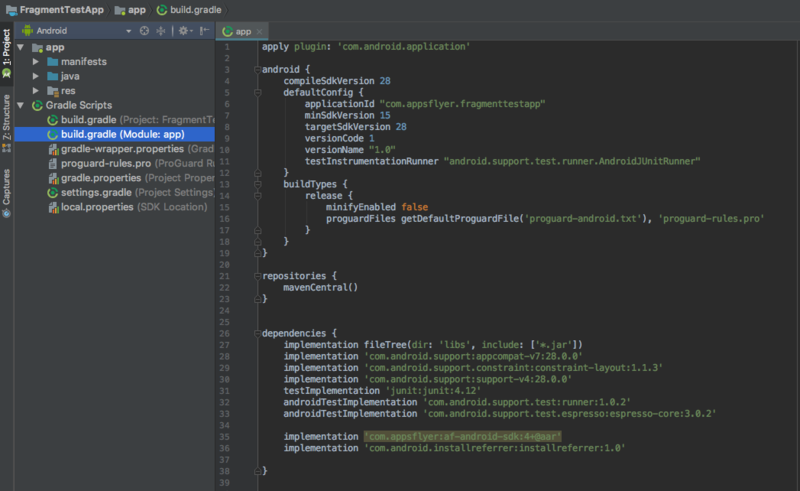 If you are not using Gradle, download and add the AF-Android-SDK.jar to the project's class path. Add the implementation dependency with the latest version of the AppsFlyer SDK. The 'com.android.installreferrer:installreferrer:1.0' dependency is required to support Google's Play Install referrer API. Using this API improves attribution accuracy, protects from install fraud and more. The API is supported from AppsFlyer's Android SDK version 4.8.6 and onwards. If updating from an older SDK version complete this new dependency's integration by updating the SDK's init method. If you get the error "Unresolved class SingleInstallBroadcastReceiver" after adding the receiver to AndroidManifest.xml, make sure to build the app first. Initialization of the SDK is completed in two stages. In the first stage the DevKey is supplied along with an optional conversionDataListener. In the second stage the call to startTracking indicates that all relevant preparations are complete (e.g. call setCustomerUserId) and the SDK can start tracking all events. Alternatively, you can delay the call to startTracking and place it within any relevant Activity OnCreate() function. The following dependency: implementation 'com.android.installreferrer:installreferrer:1.0' And the getApplicationContext() passed in the following method: AppsFlyerLib.getInstance().init(AF_DEV_KEY, getConversionListener(), getApplicationContext()); are the prerequisite for reporting Google's New Referrer API to AppsFlyer. This API enables AppsFlyer to detect installations, sessions, and updates. In-App Events provide insight on what is happening in your app. It is recommended to take the time and define the events you would like to measure to allow you to track ROI (Return on Investment) and LTV (Lifetime Value). Tracking in-app events is performed by calling trackEvent with event name and value parameters. See In-App Events documentation for more details. //eventName is any string to define the event name. //eventValues is a map of event parameters that comprise a rich event. AppsFlyer supports non-English characters with in-app events, or with any other SDK API, starting from Android SDK version 4.8.1. Do not add any currency symbol or commas to the figures, as these are not recognized. We highly recommend to have Deep Linking integrated in your app. Deep Linking is a crucial part of retargeting campaigns and it is highly recommended to use when running retargeting campaigns. Activities that are meant to be opened by deep linking should have the below intent filter on the activity definitions in the manifest file. The Scheme configured correlates with the af_dp value you include in your tracking link. To receive your deep link data, you must implement the callback onAppOpenAttribution called by the AppsFlyer SDK. It returns the Onelink/tracking link parameters used to trigger the app open. Then, you can parse the values and apply the logic to trigger the relevant app page. For more information, click here, or review this article’s Get Conversion Data section. Use the af_revenue (AFInAppEventParameterName.REVENUE) event parameter to count revenue as part of an in-app event. You can populate it with any numeric value, positive or negative. af_revenue is the ONLY event parameter that is counted on AppsFlyer as real revenue on the raw data and dashboard. For more details please click here. Setting user local currency code for in-app purchases - the currency code should be a 3 character ISO 4217 code. (default is USD). AppsFlyer allows you to access the user attribution data in real-time for every new install, directly from the SDK level. By doing this you can serve users with personalized content or send them to specific activities within the app, which can greatly enhance their engagement with your app. Setting your own customer ID enables you to cross-reference your own unique ID with AppsFlyer’s unique ID and the other devices’ IDs. This ID is available in AppsFlyer CSV reports along with Postback APIs for cross-referencing with your internal IDs. It is recommended to set your Customer User ID as soon as possible as it is only associated to events reported after its setup. If setCustomerUserId is called before calling startTracking, you will have the Customer User ID in the raw export for installs and for events. If it is set after, you will see the value only for events tracked after calling this method. Customer User ID can also be used to complete integrations with Analytics platforms such as Mixpanel and Swrve. By default, IMEI and Android ID are not collected by the SDK if the OS version is higher than KitKat (4.4) and the device contains Google Play Services (on SDK versions 4.8.8 and below the specific app needed GPS). AppsFlyer enables you to measure the uninstalls rate of users coming from different sources. To complete this process fully and correctly read here. AppsFlyer’s SDK provides server verification for in-app purchases. To set purchase validation tracking, call the validateAndTrackInAppPurchase method inside the onActivityResult function. This call automatically generates an af_purchase in-app event. This call has two callback blocks, one for ‘Success’ and one for ‘Failure’ (for any reason, including validation fail). Calling validateAndTrackInAppPurchase automatically generates an af_purchase in-app event. There is no need to send this event yourself. Anonymizing users SEVERELY impacts your attribution information. Use this option ONLY for regions which legally prevents you from collecting your users' information. Use the stopTracking API only in cases where you want to fully ignore this user from any and all tracking. Using this API SEVERELY impacts your attribution, data collection and deep linking mechanism. It is possible to delay the SDK Initialization until the customerUserID is set. This feature makes sure that the SDK doesn't begin functioning until the customerUserID is provided. If this API is used, all in-app events and any other SDK API calls are discarded, until the customerUserID is provided and tracked. immediately before the init() method. The rest of the SDK initialization should remain unchanged. to provide the SDK with the relevant customer user id and trigger the SDK to begin its normal tracking. Use this API only in cases where it is appropriate for your business logic. Using this API increases the chance for discrepancies and might make the app more exposed to fraud. 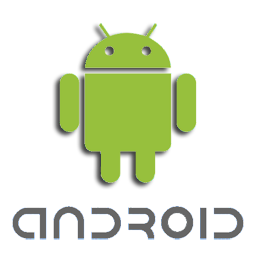 There are various methods available for Android attribution for pre-installed apps. If you want to receive a confirmation that the tracking request was successfully received by the AppsFlyer servers, it is possible to implement the AppsFlyerTrackingRequestListener listener. The onTrackingRequestSuccess() callback method is invoked for every 200 response to an attribution request made by the SDK. The onTrackingRequestFailure(String error) callback method is invoked for any other response and returns the response as the error string. To test the SDK integration before and after submitting to the Google Play Store click here. 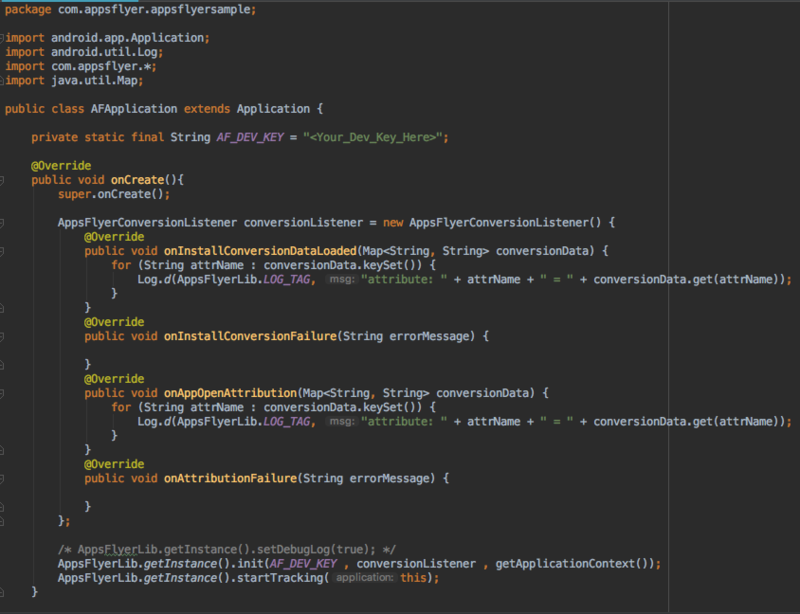 We just wanted to let you know that a new AppsFlyer Android SDK has been released - version 4.9.0. The new version contains various SDK bug fixes, for example for specific scenarios of deep linking and push notifications. If your last SDK update is from before Sep. 18 (i.e. 4.8.15 or below) we recommend updating to the new version 4.9.20.